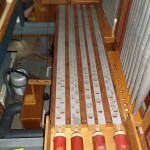 H&H 1980: 2 manuals, 10 stops; enlarged 1991 to 2 manuals, 13 stops. 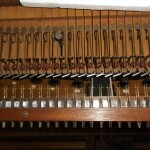 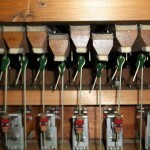 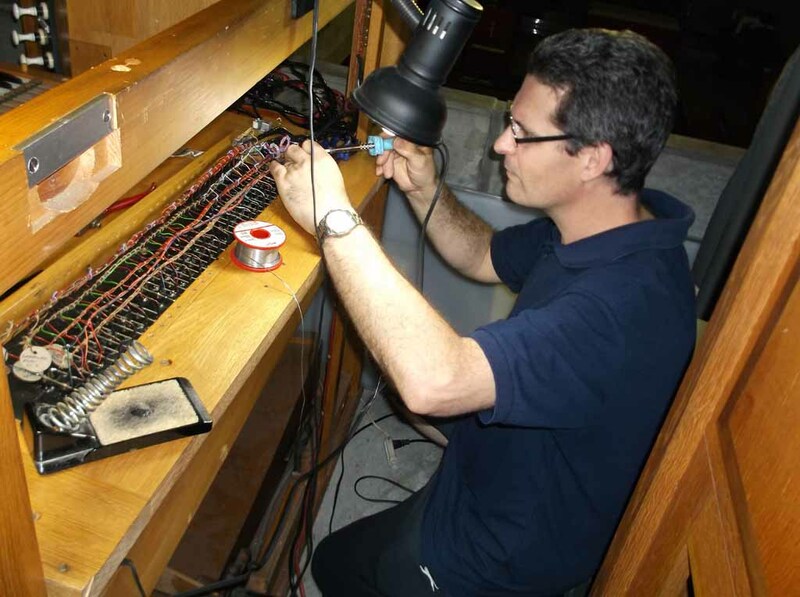 The operation of the whole organ will be checked, cleaned and repaired where needed. 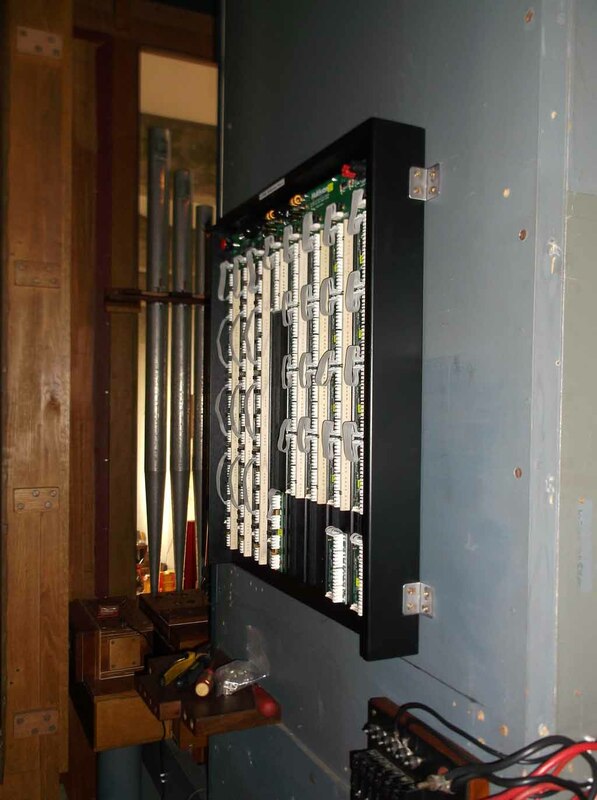 Low voltage power supplies, wiring and fusing renewed; a new processor based coupling system installed and piston relays renewed. 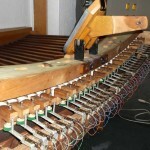 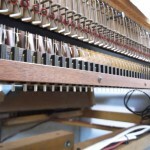 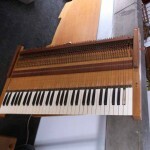 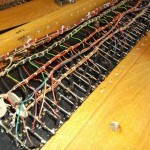 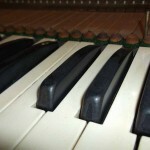 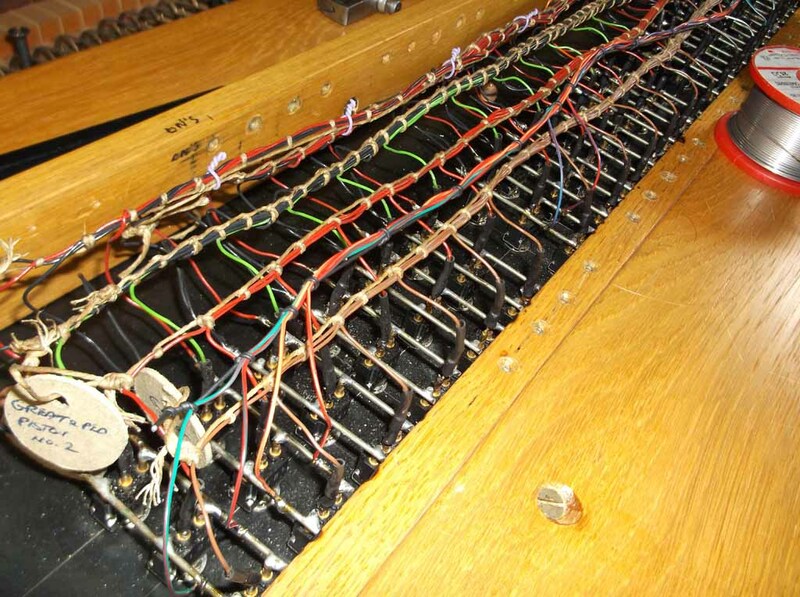 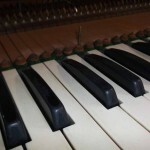 The keyboards were dismantled, wear taken up and new contacts fitted. 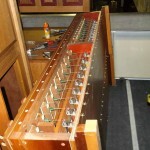 The pedalboard was dismantled, wear taken up and new contacts fitted. 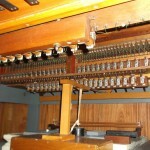 The drawstop contacts were cleaned and adjusted. 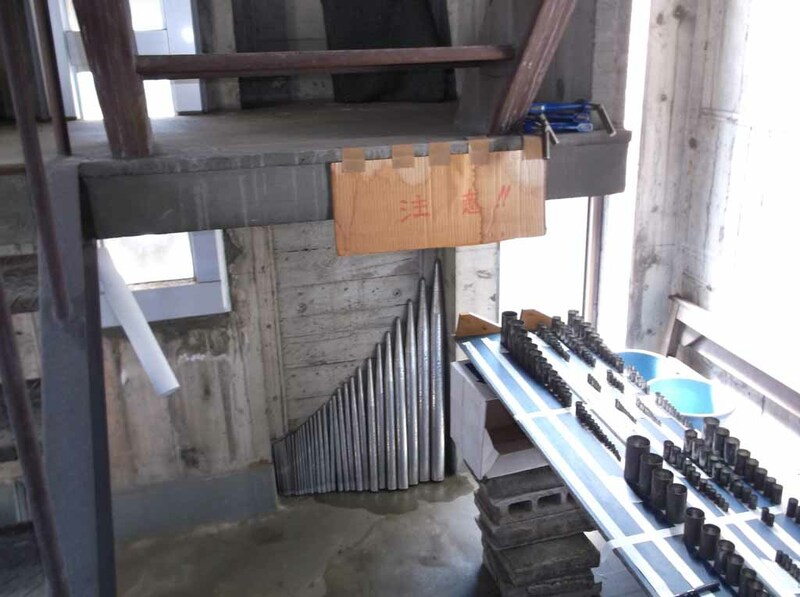 The piston contacts were cleaned and adjusted. 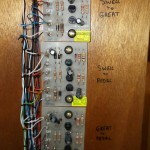 The swell pedal was refaced and wear taken up in the mechanism. 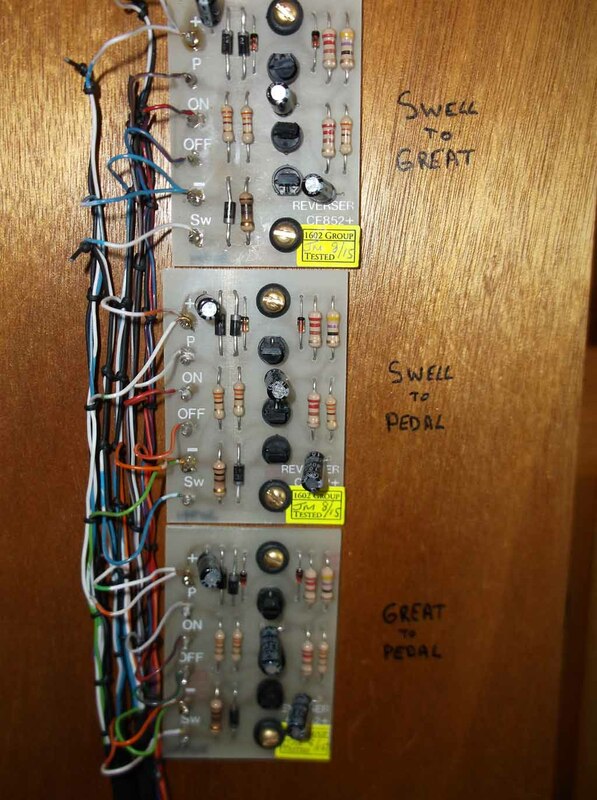 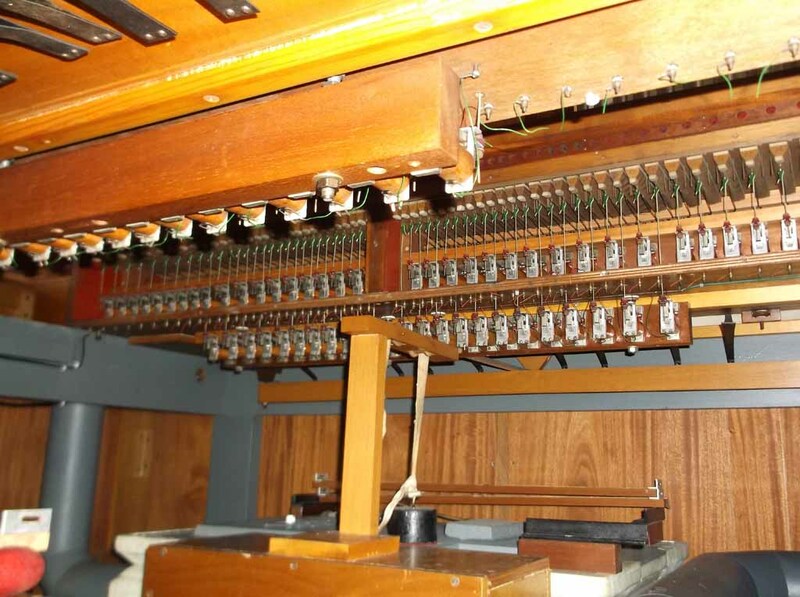 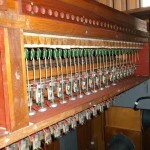 The console mechanism was reassembled and adjusted. 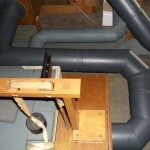 The pipework was washed and minor repairs done. 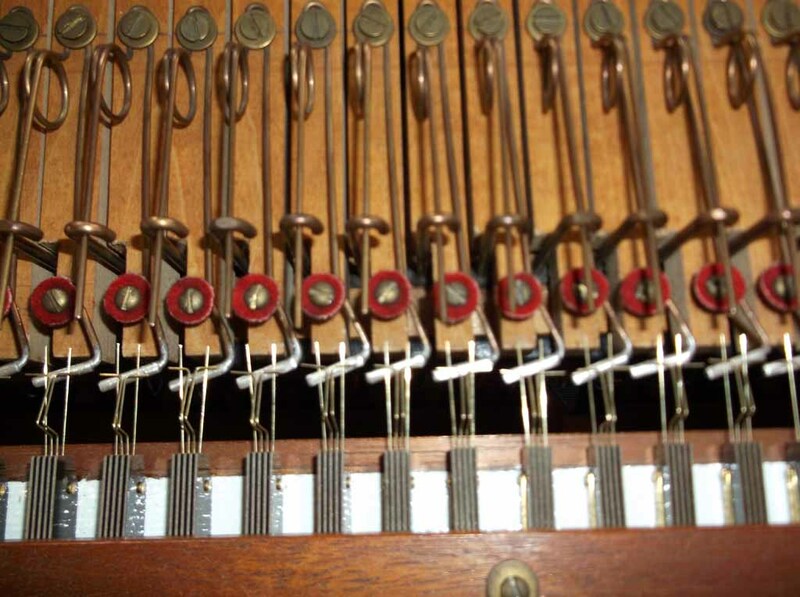 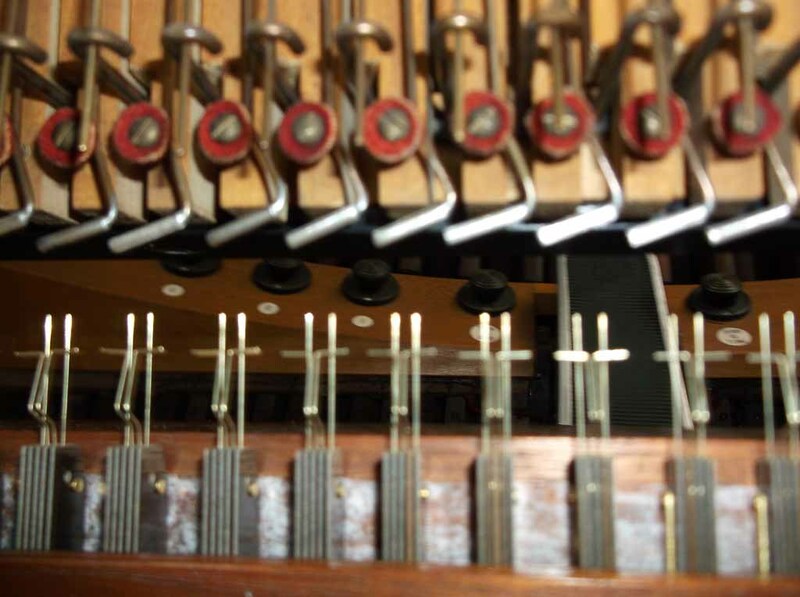 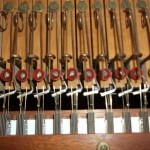 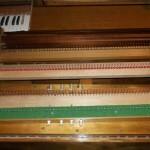 Stoppers were refitted, Reed tongues were papered and wedges tightened. 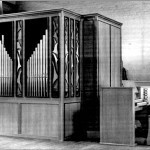 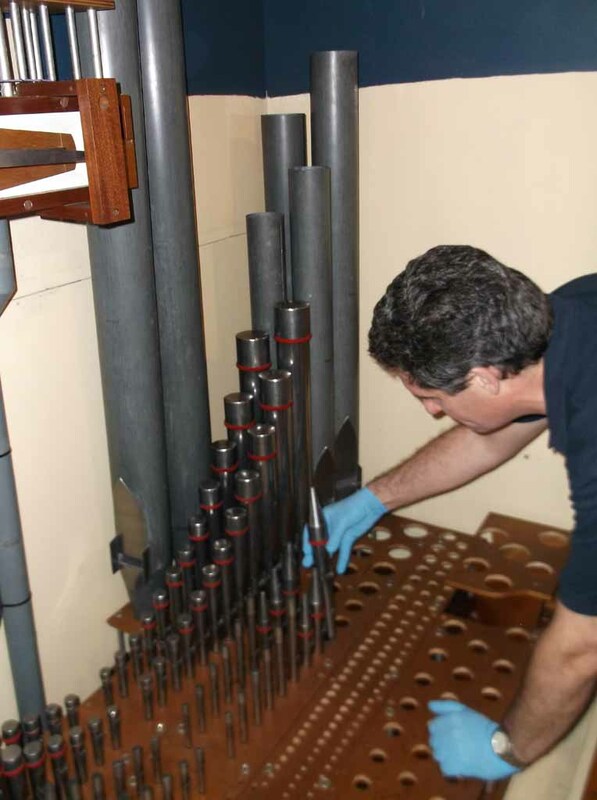 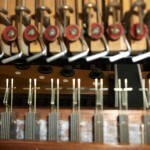 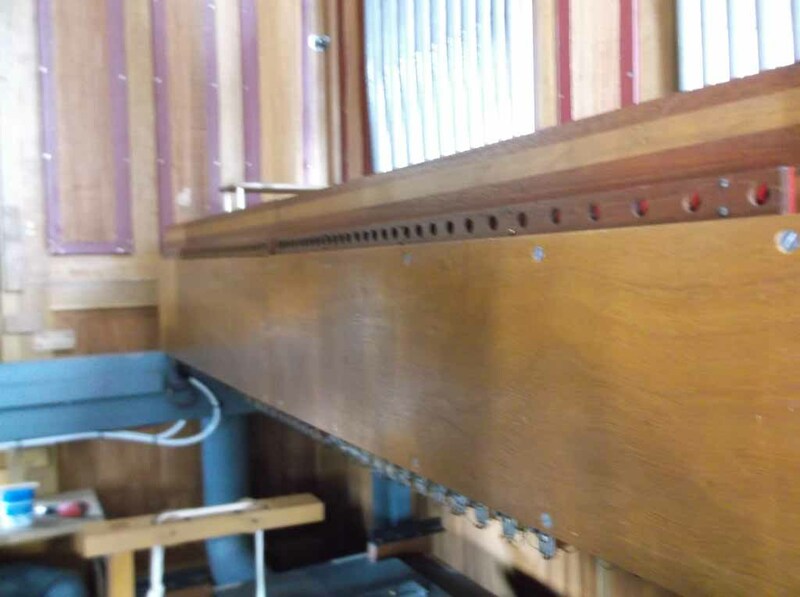 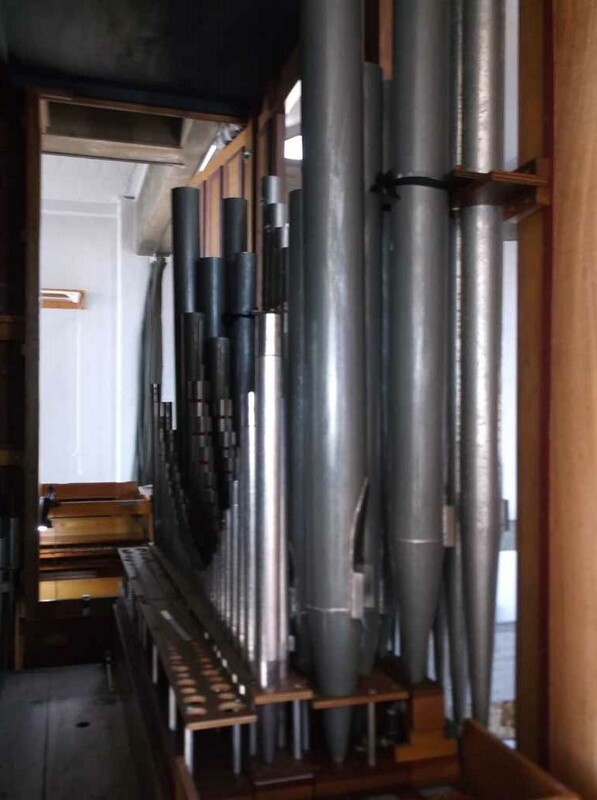 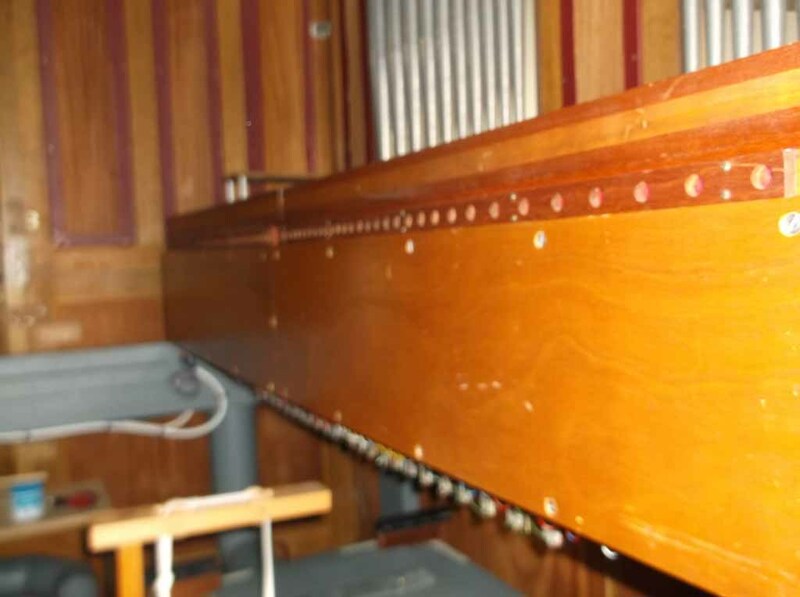 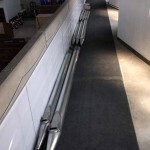 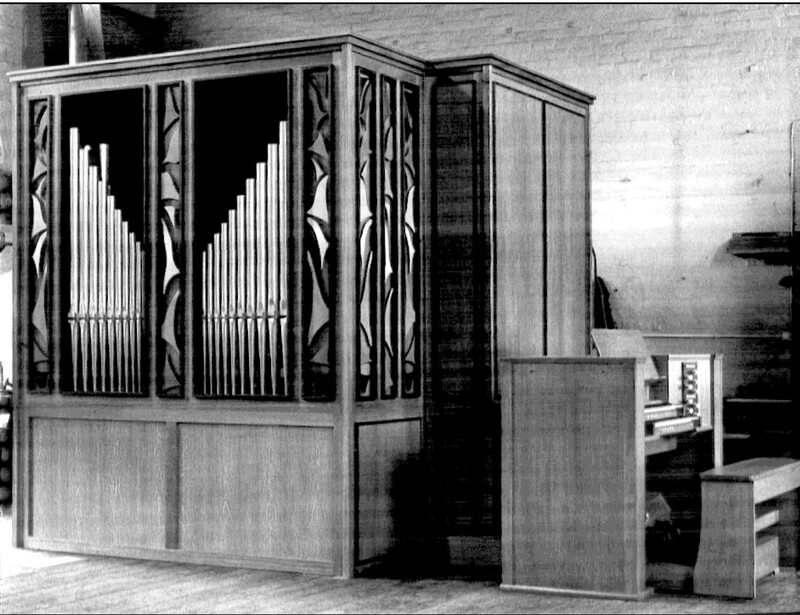 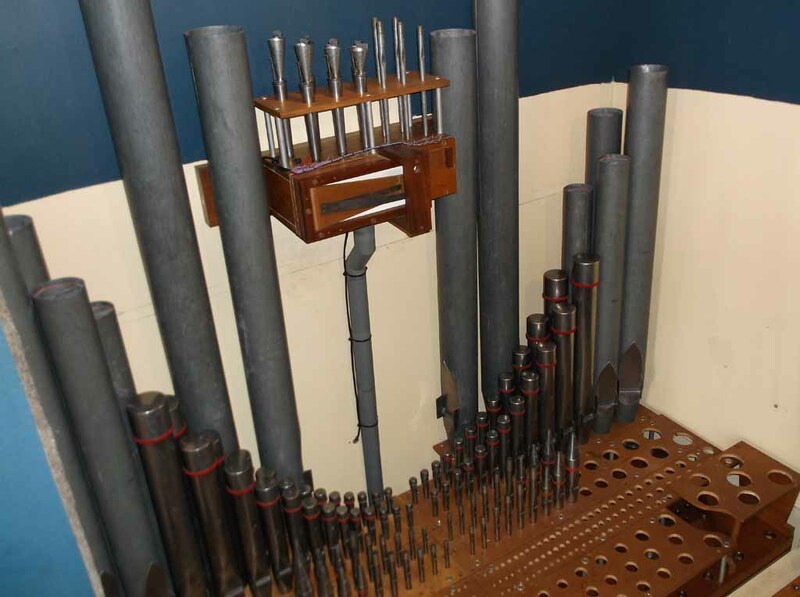 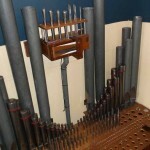 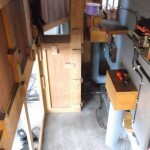 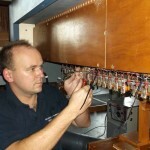 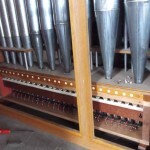 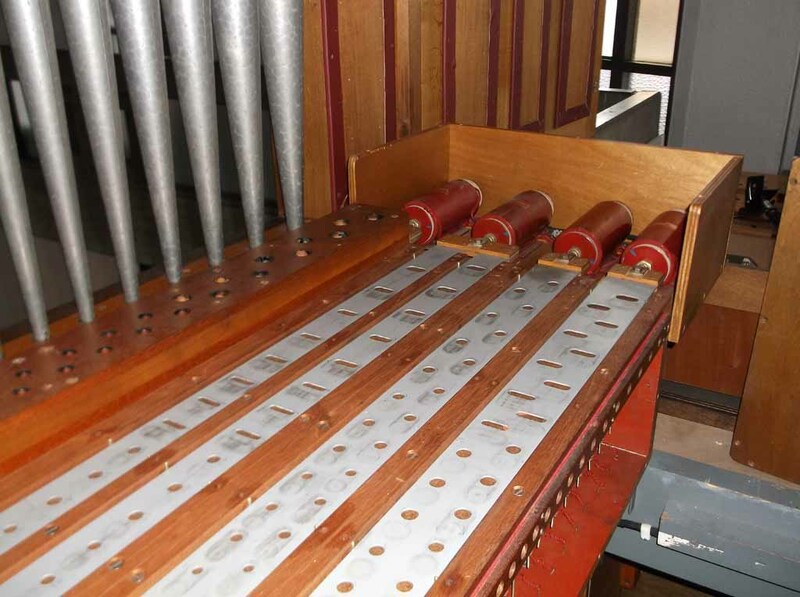 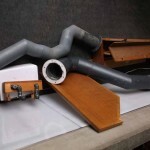 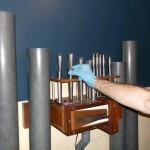 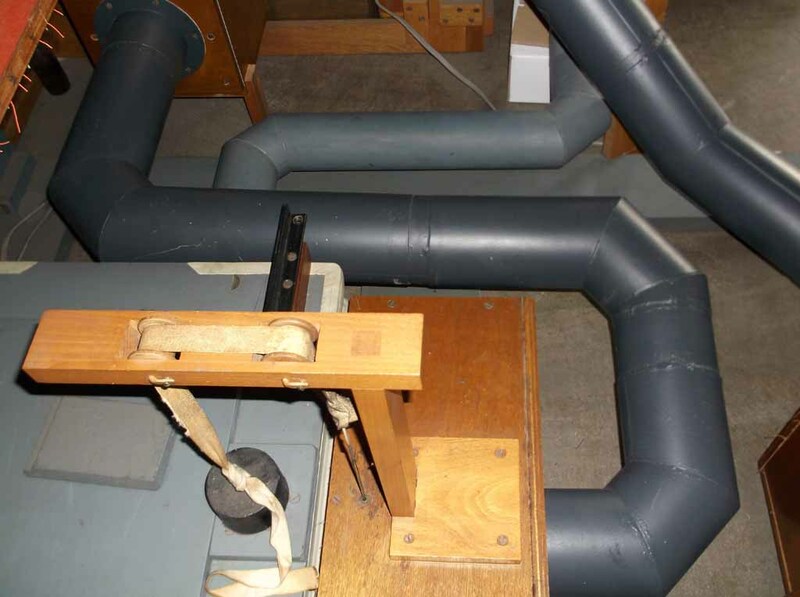 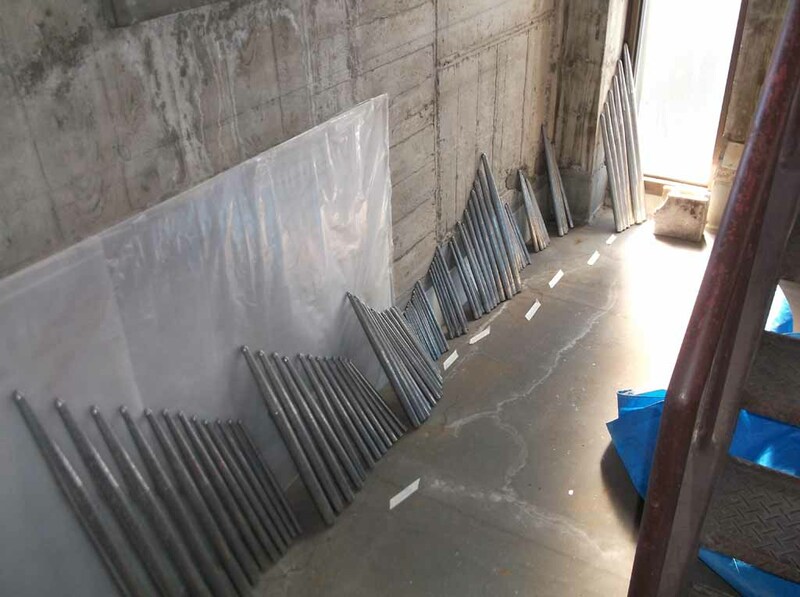 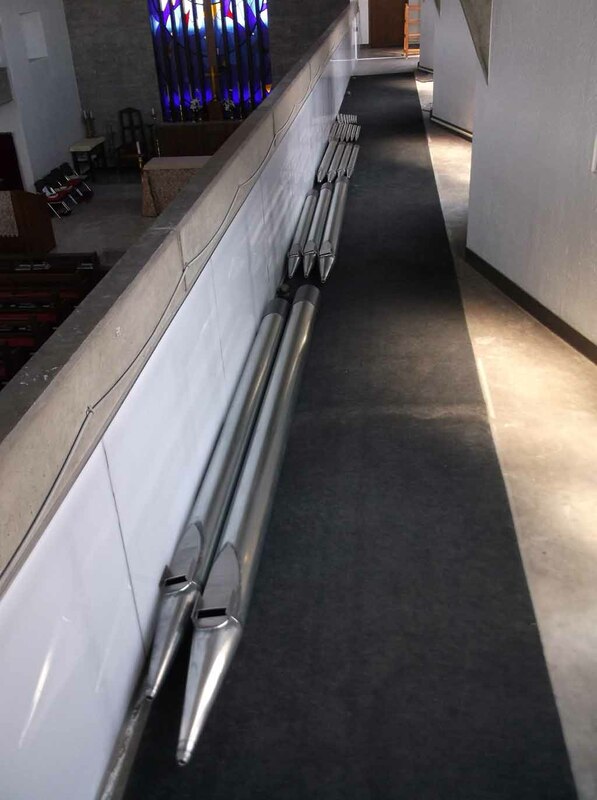 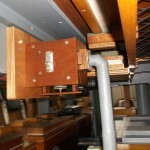 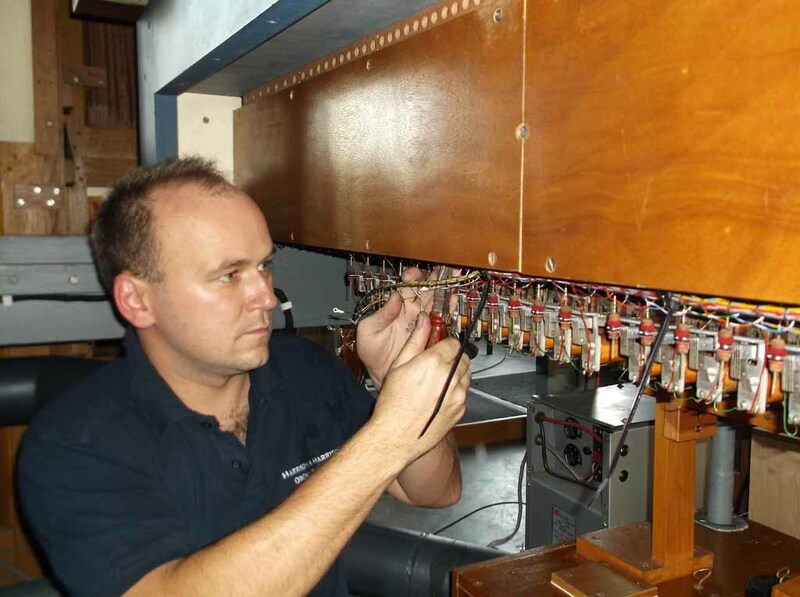 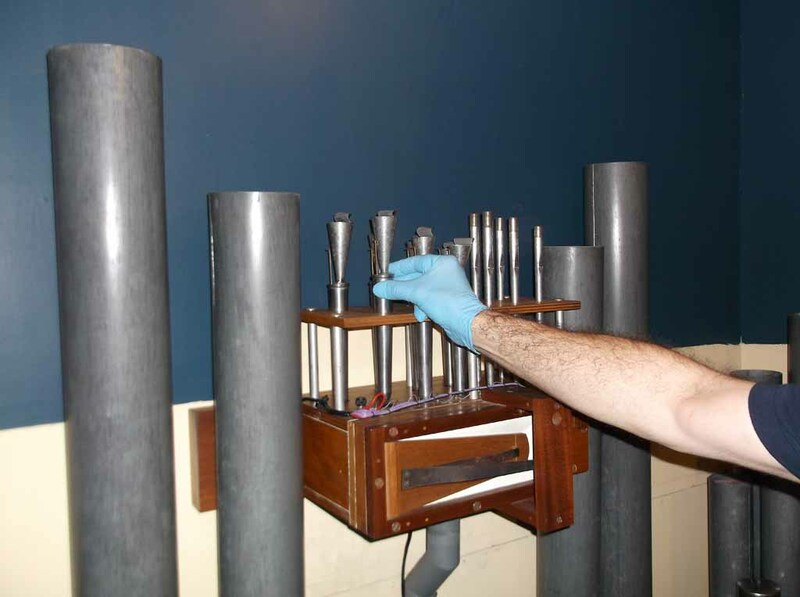 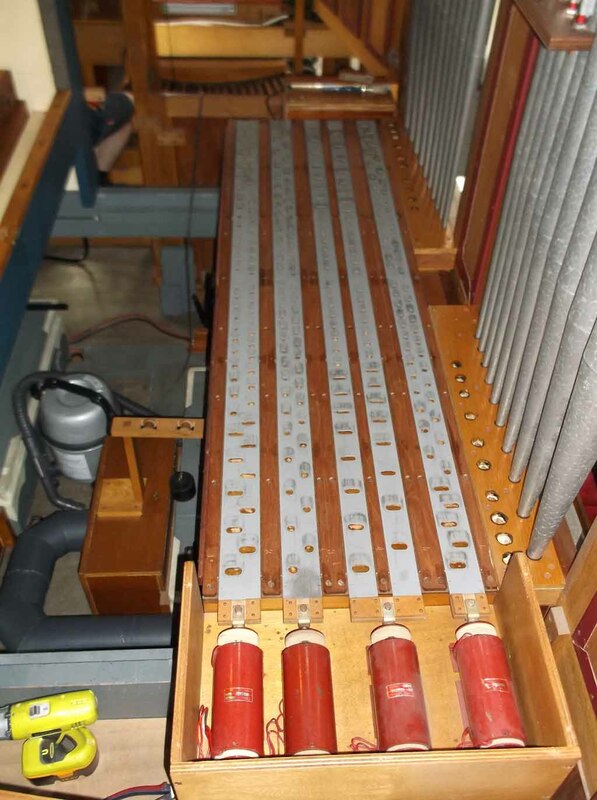 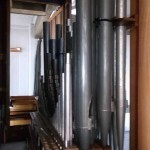 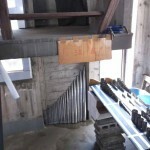 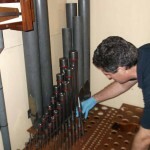 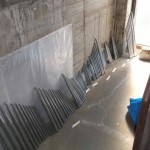 The speech and regulation of the pipework was checked and organ tuned. 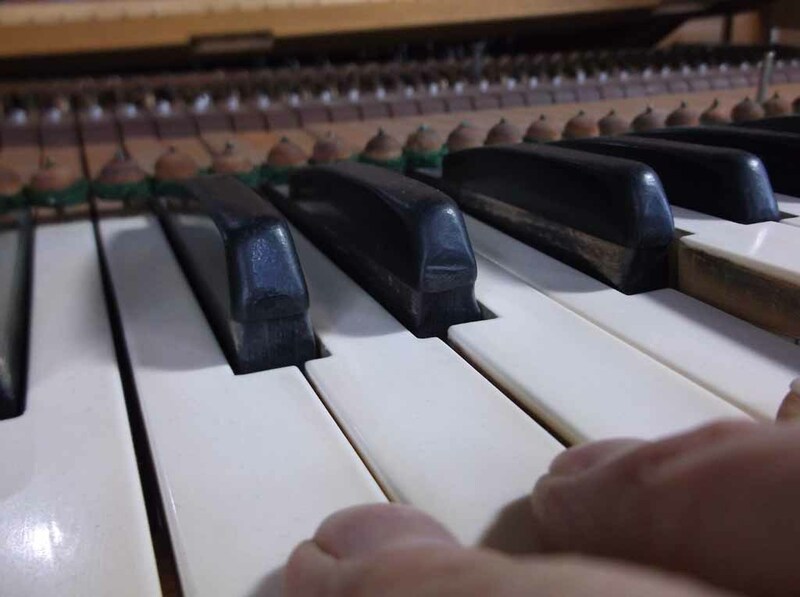 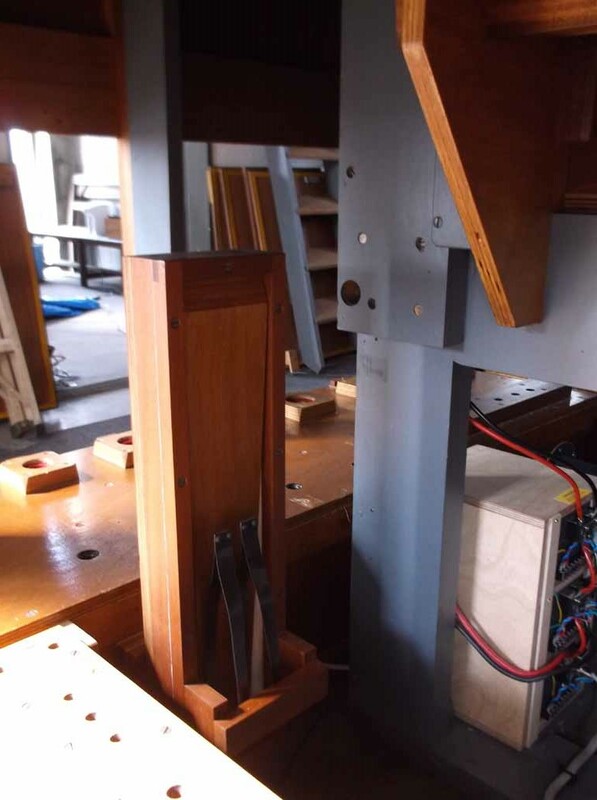 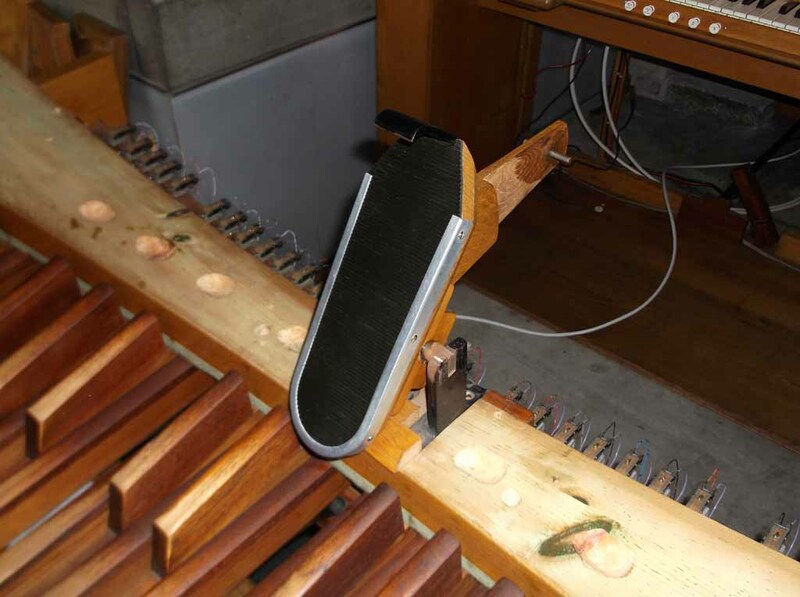 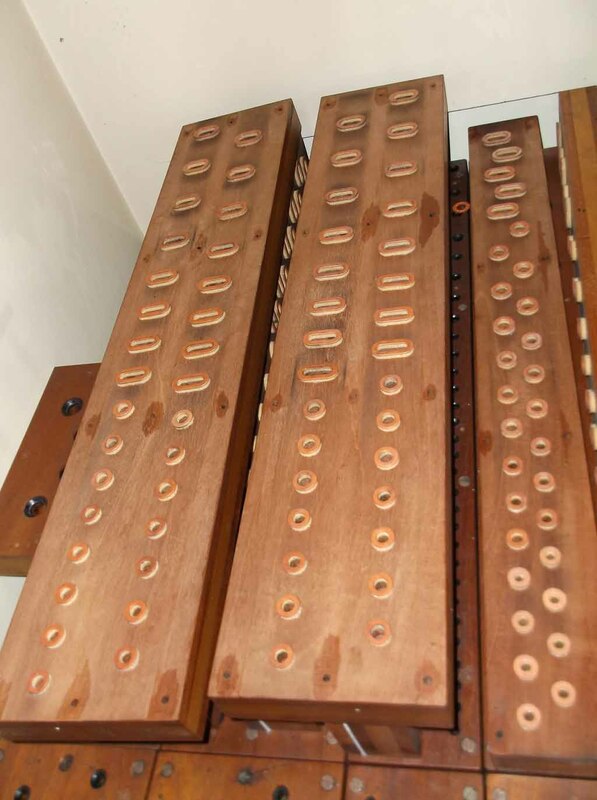 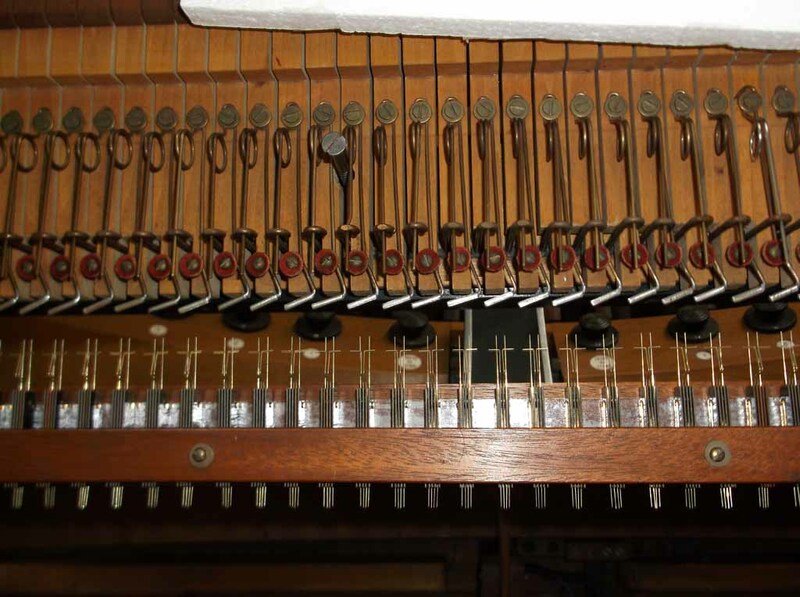 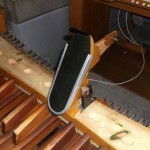 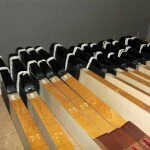 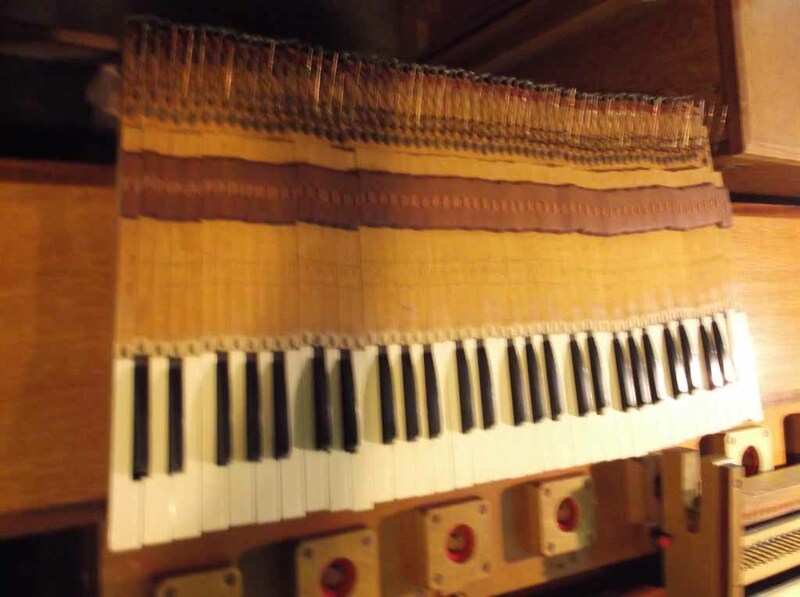 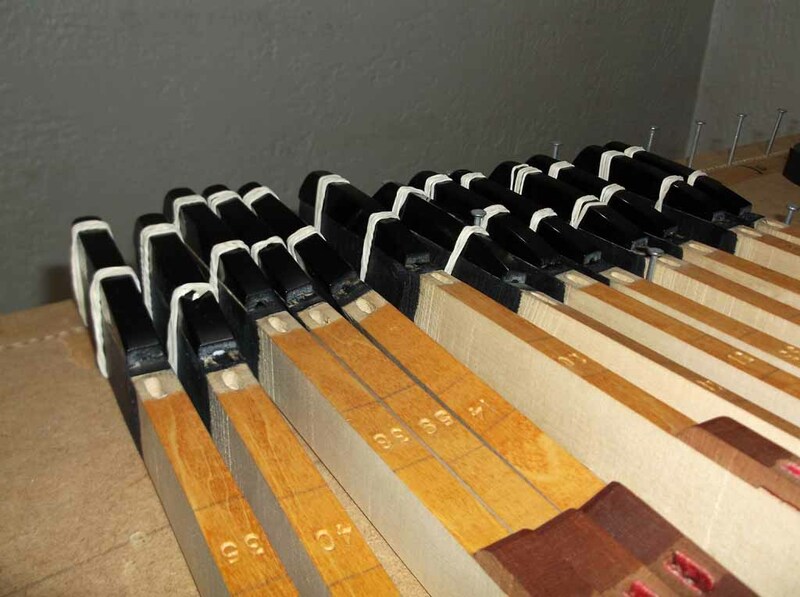 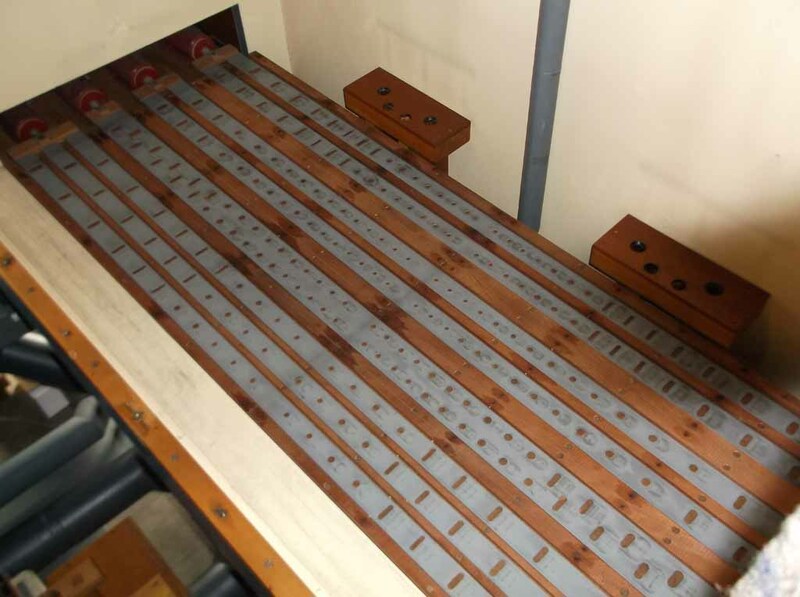 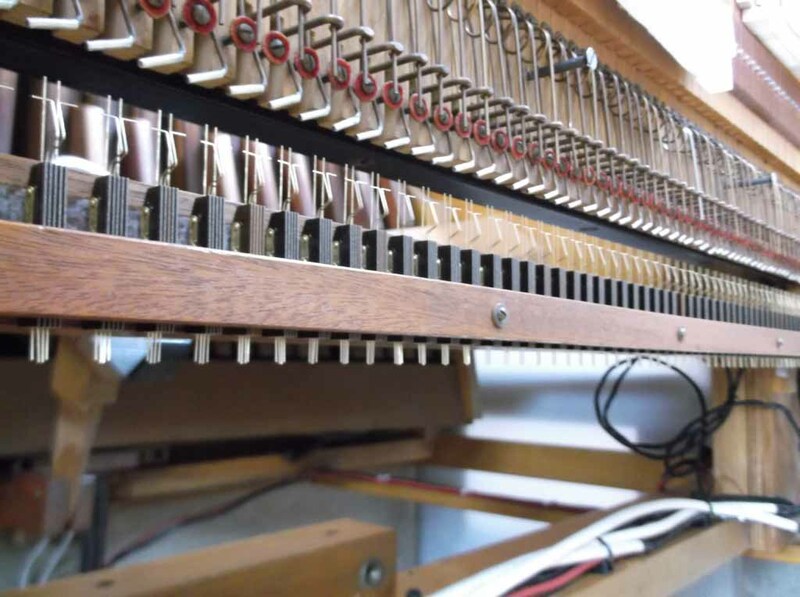 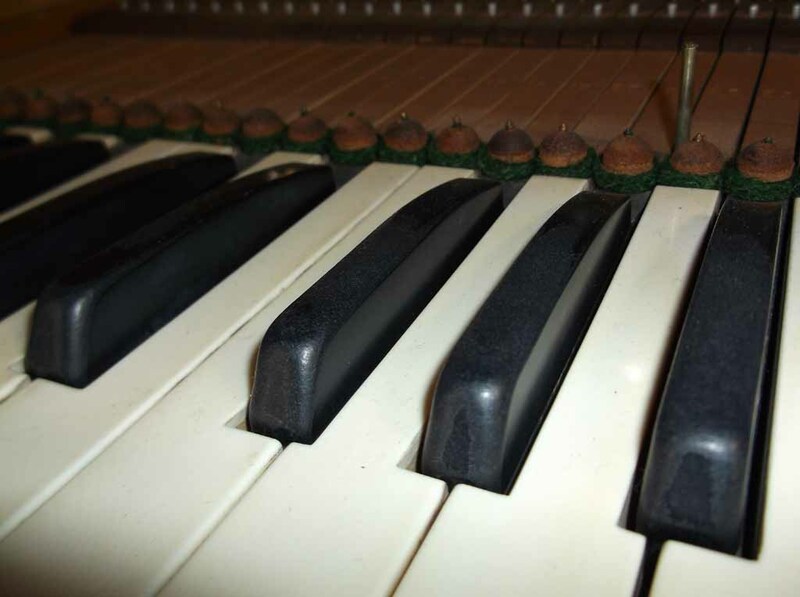 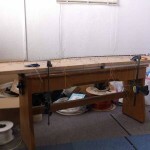 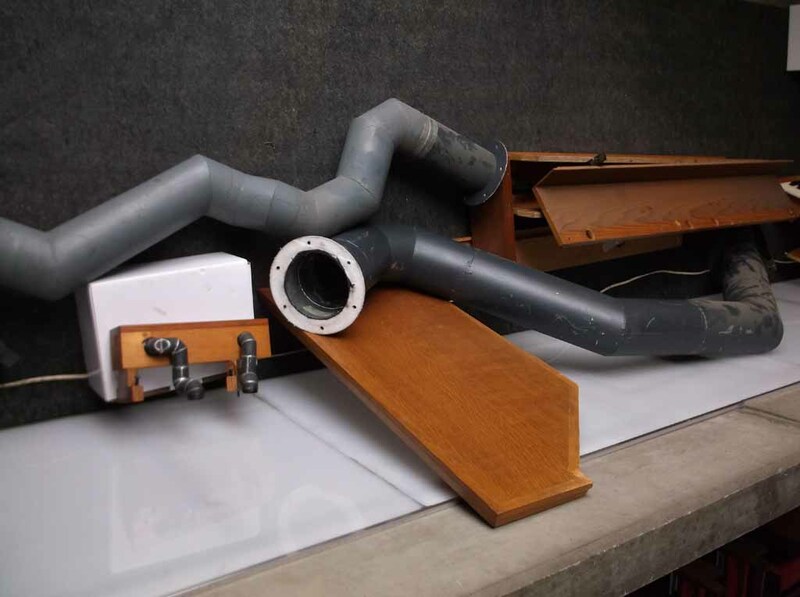 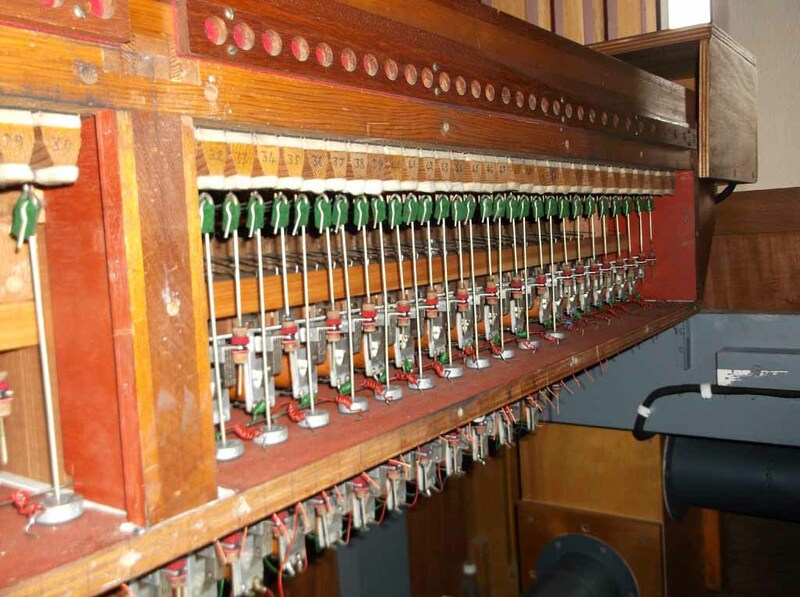 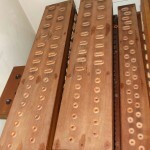 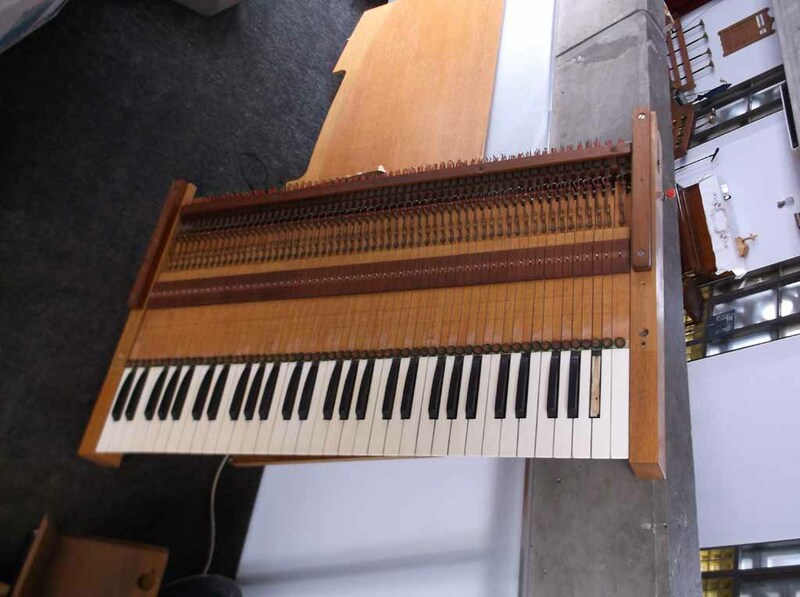 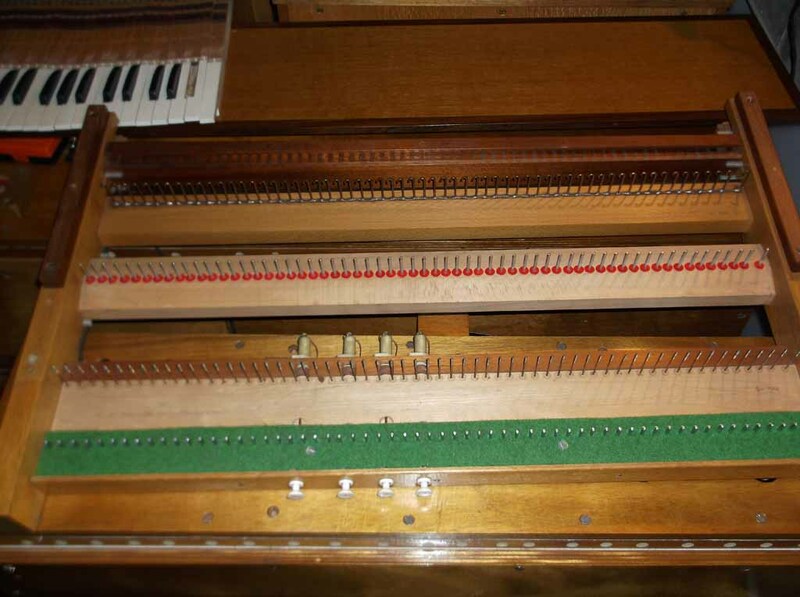 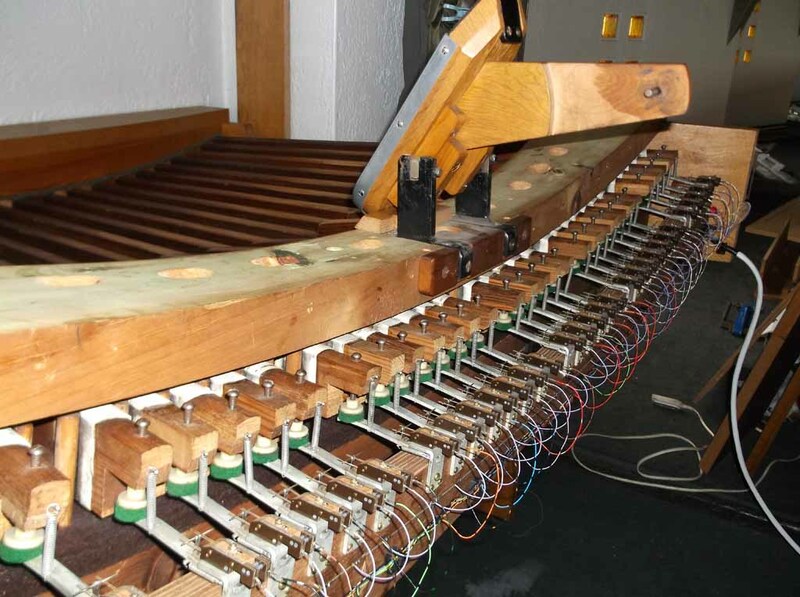 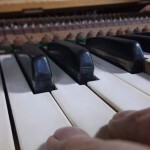 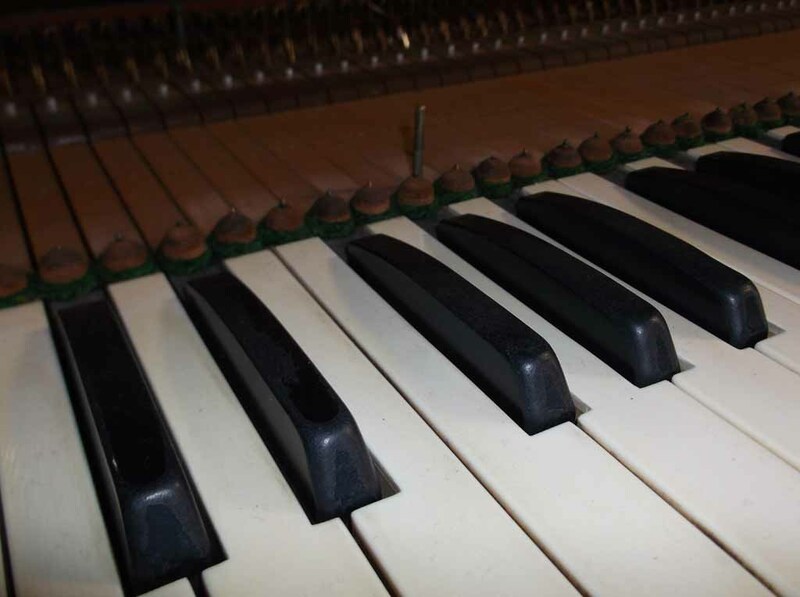 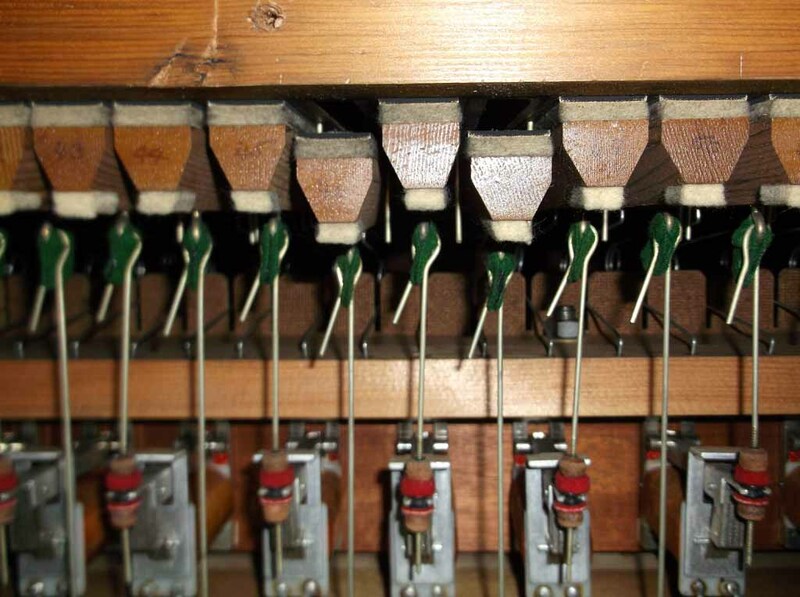 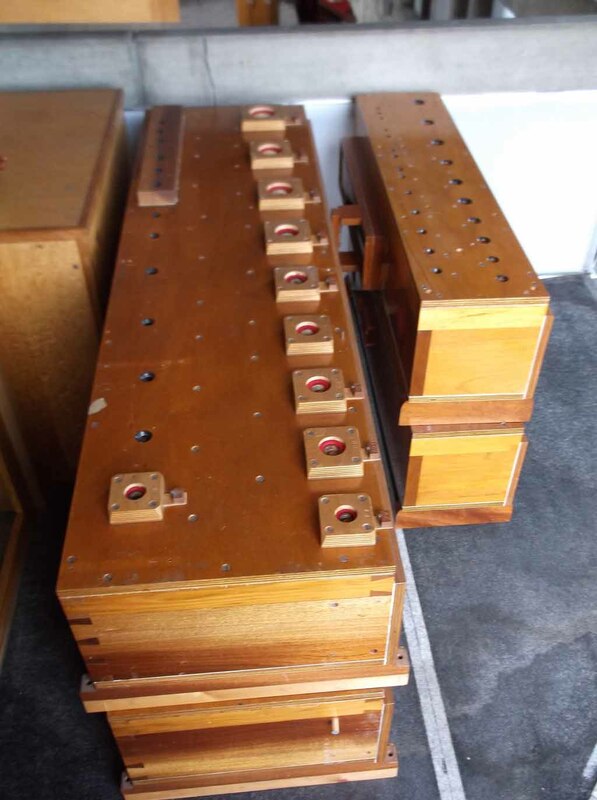 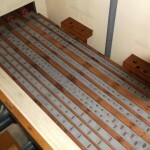 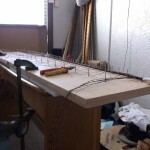 The soundboards were cleaned, upperboards lifted and the slide seals checked. 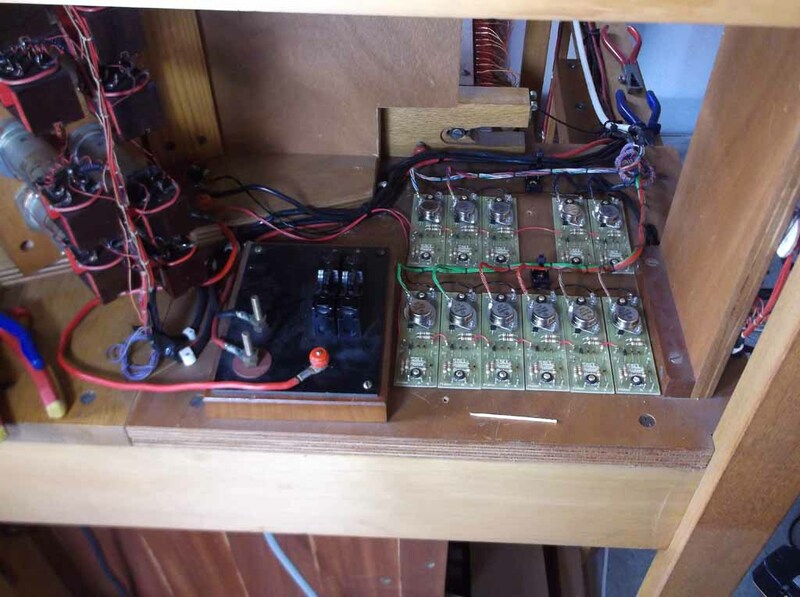 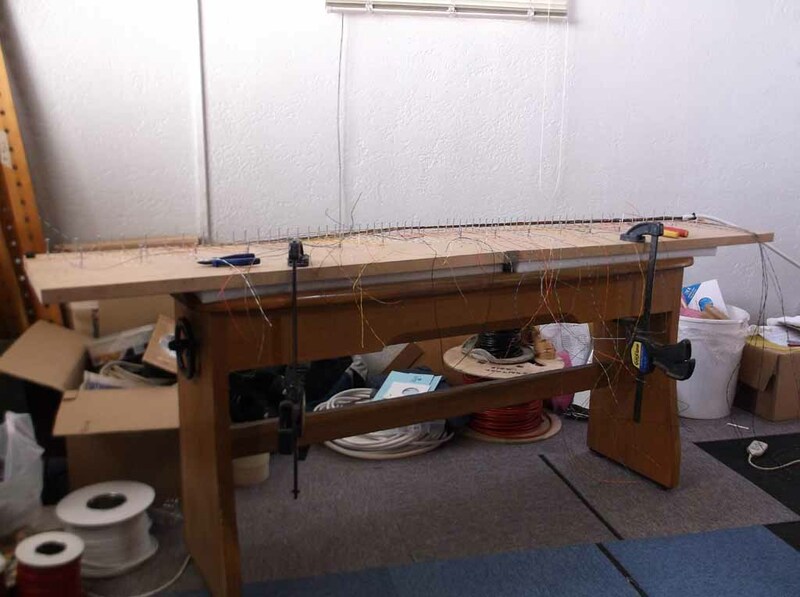 The pallet springs, actions and drawstop solenoids were adjusted. 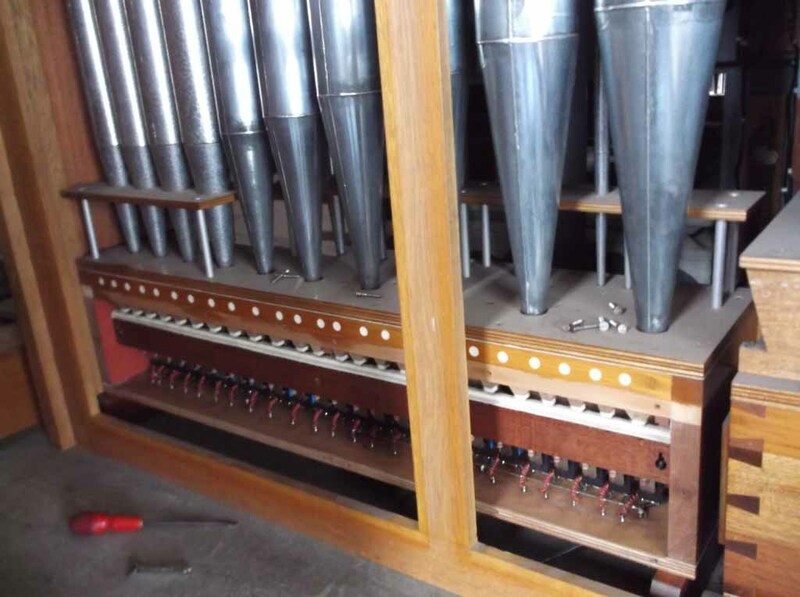 The wind system was opened up and cleaned. 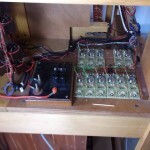 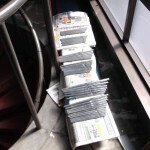 The tremulant timer was renewed. 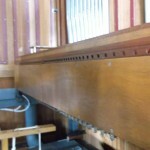 The wind system was checked and made sound. 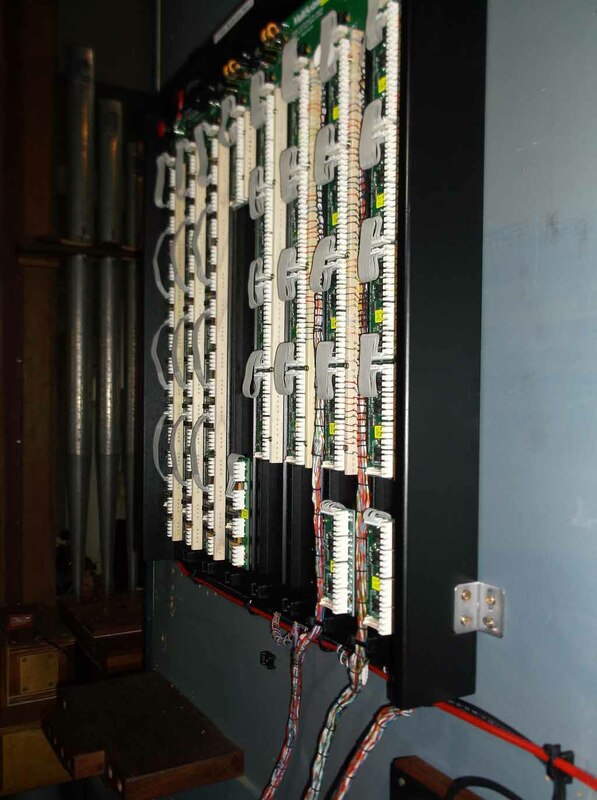 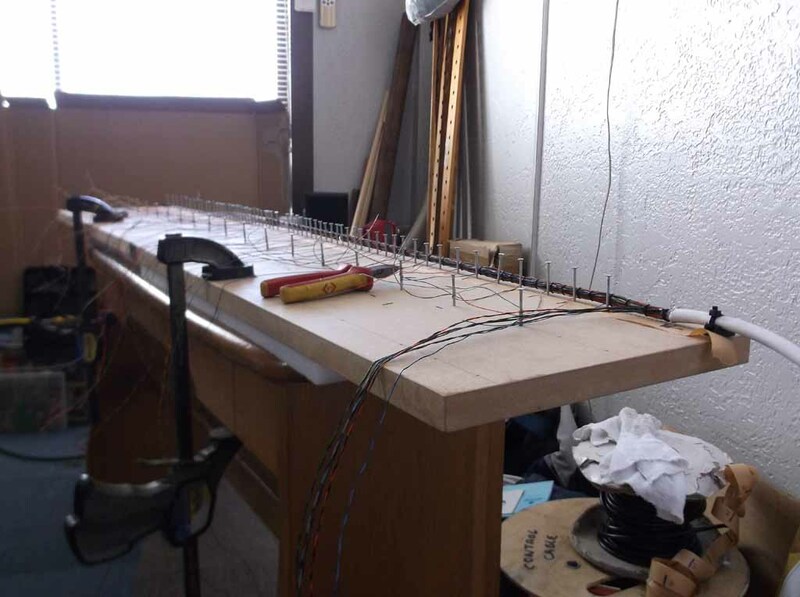 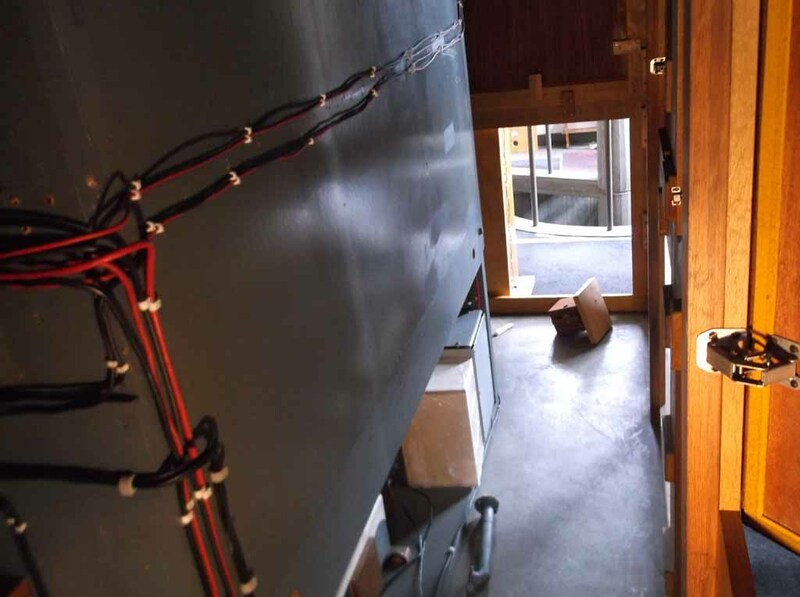 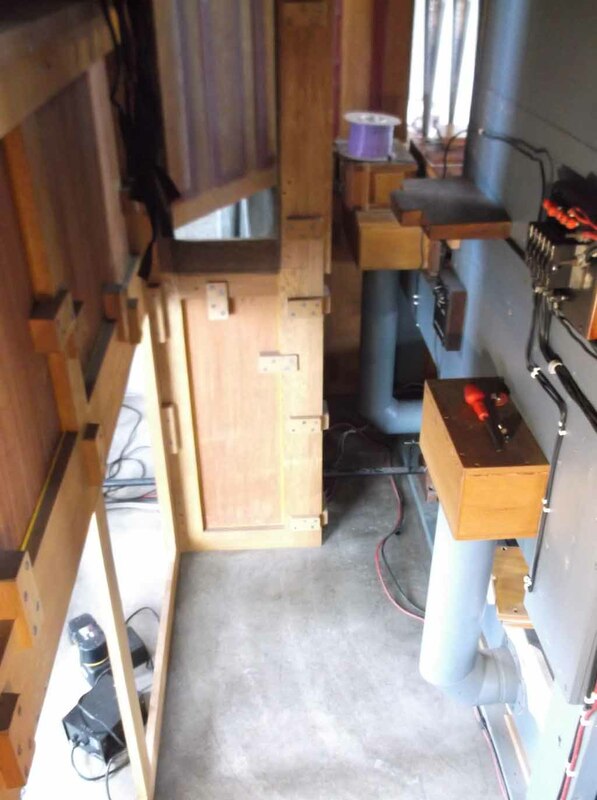 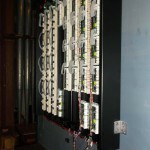 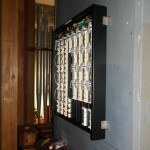 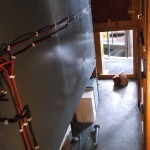 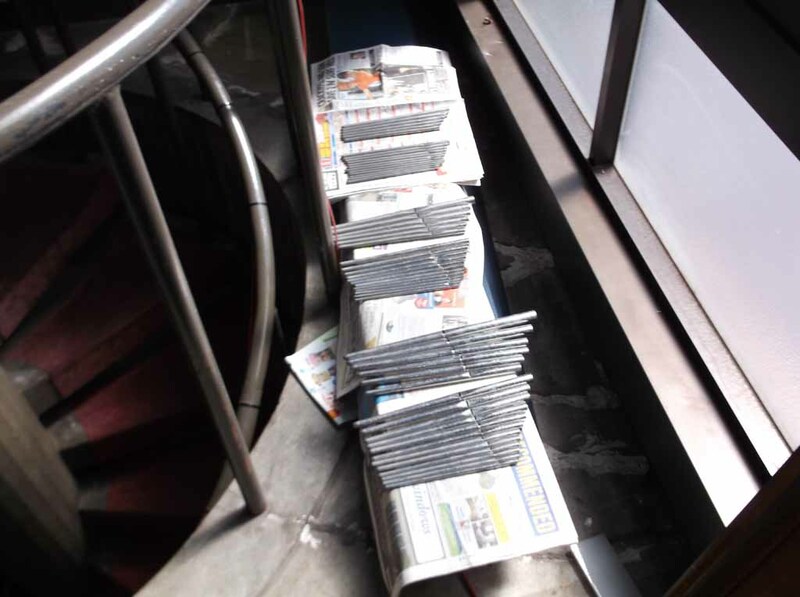 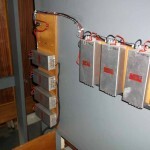 The existing low-voltage electrical system was dismantled and removed. 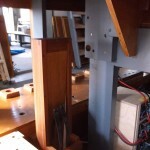 A new processor based coupling system was installed. 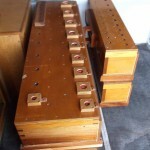 The piston relays were renewed. 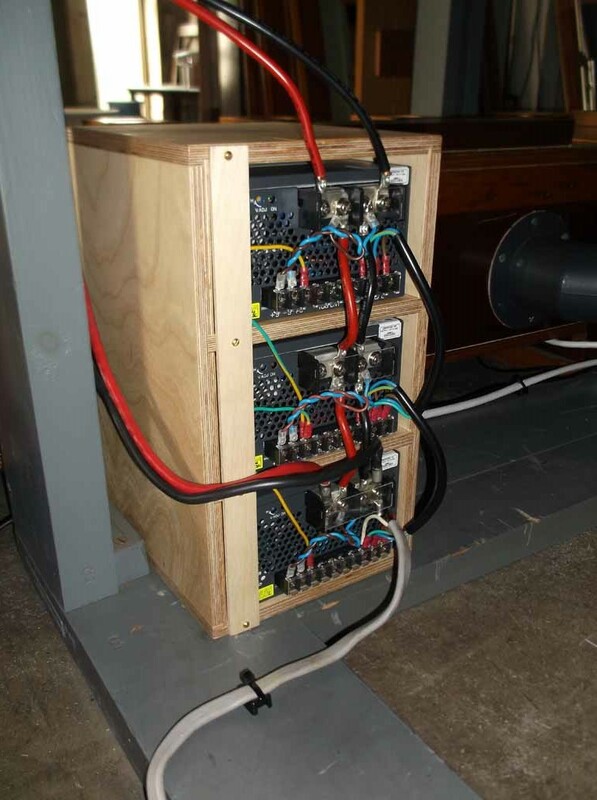 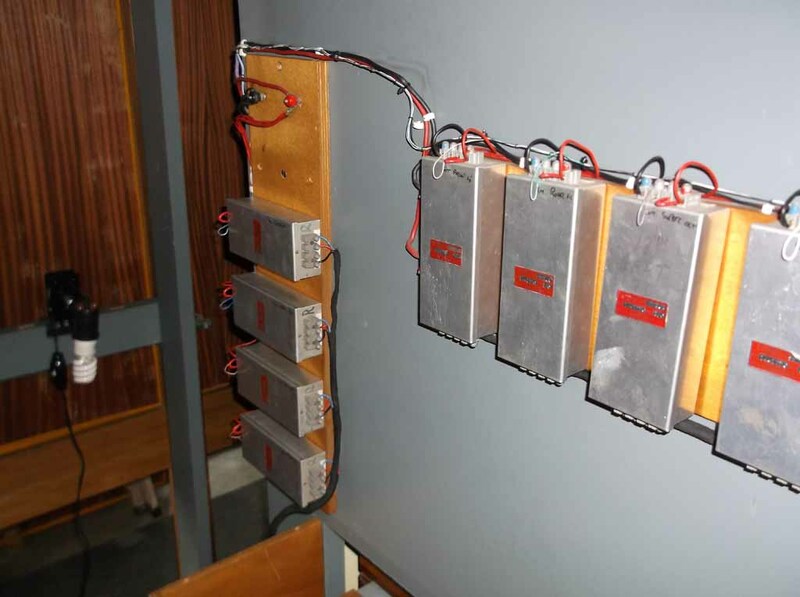 New low-voltage power supplies were installed. 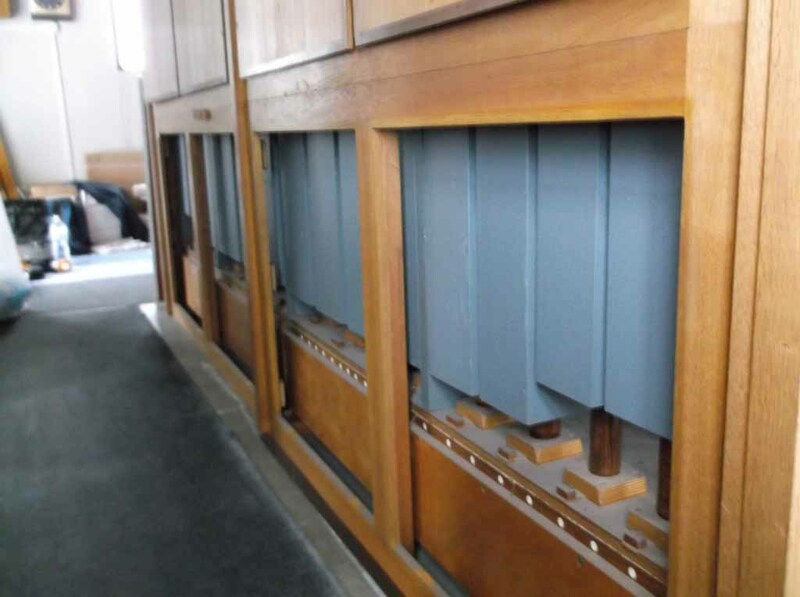 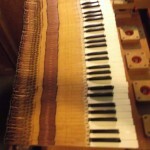 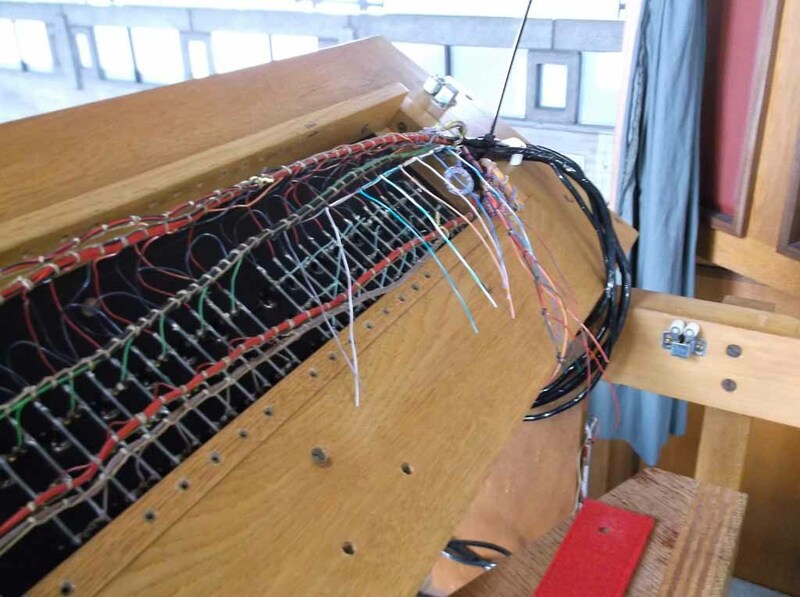 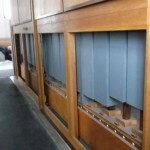 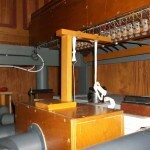 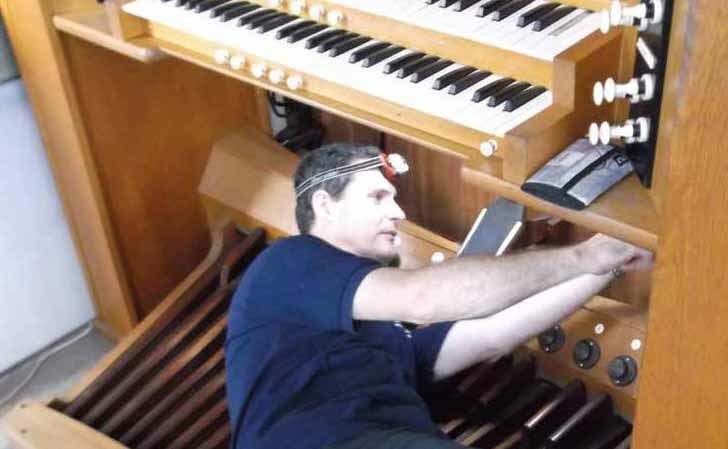 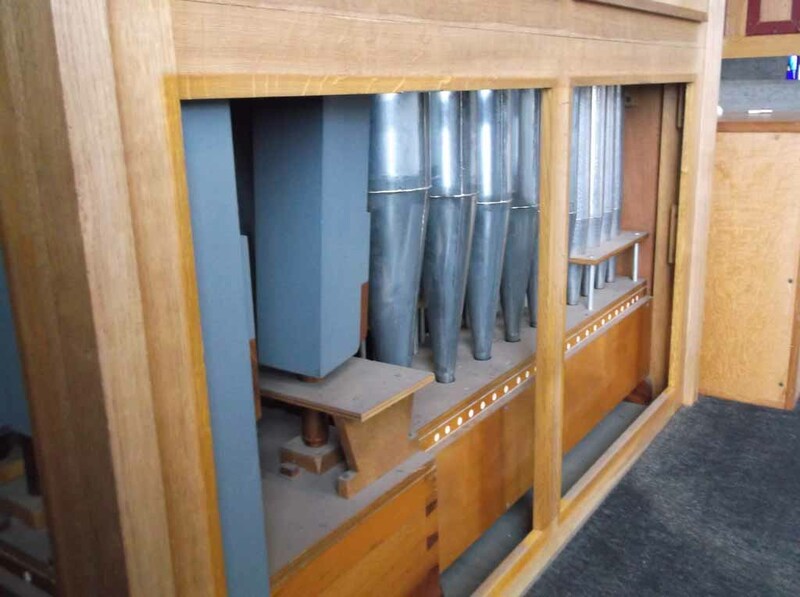 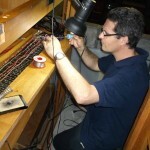 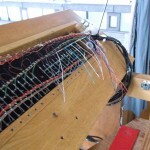 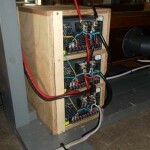 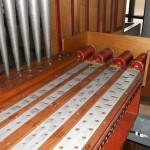 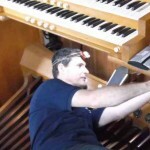 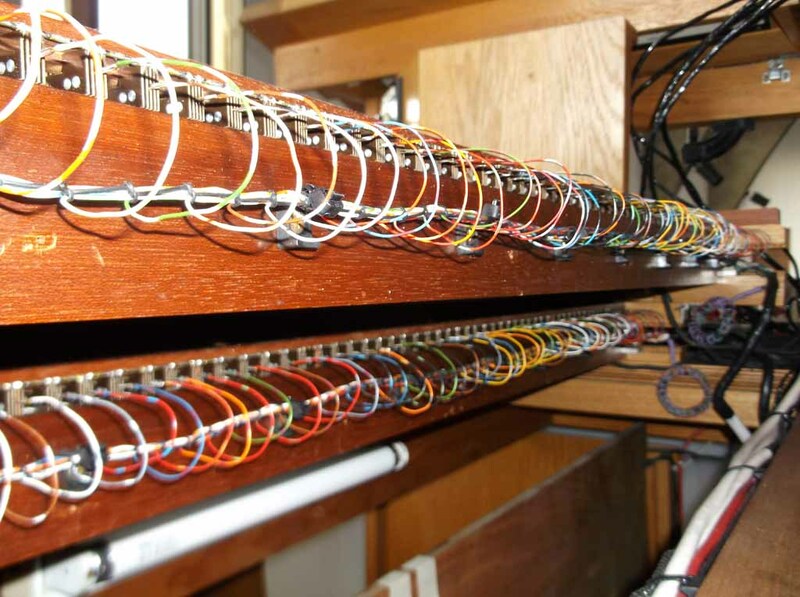 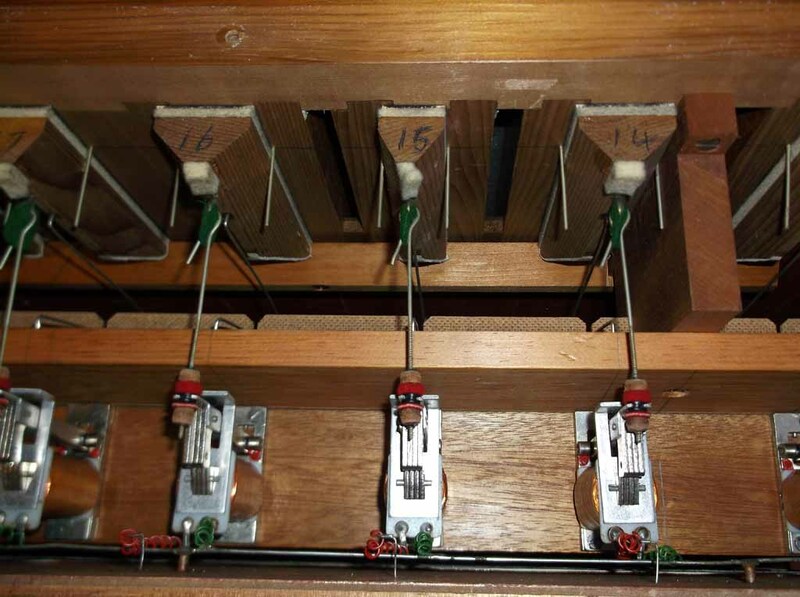 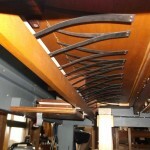 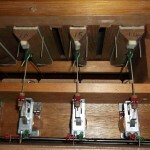 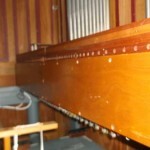 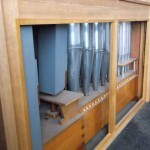 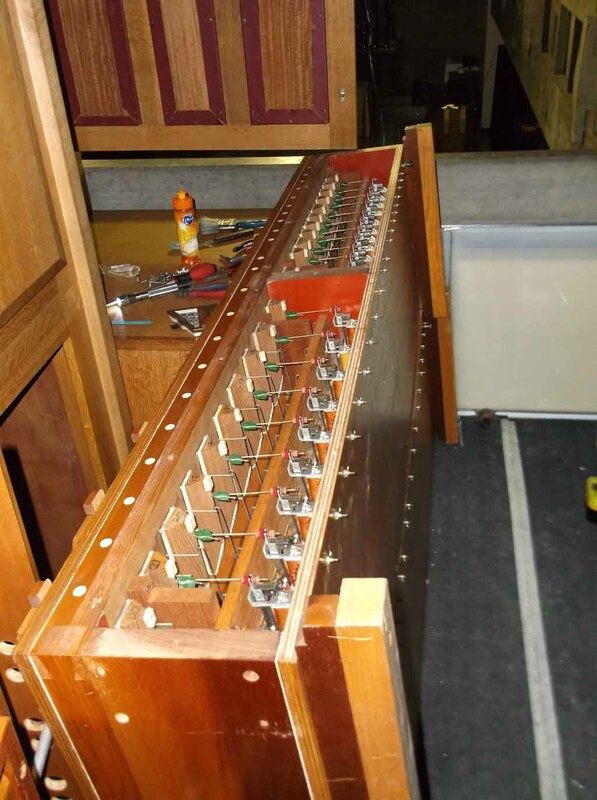 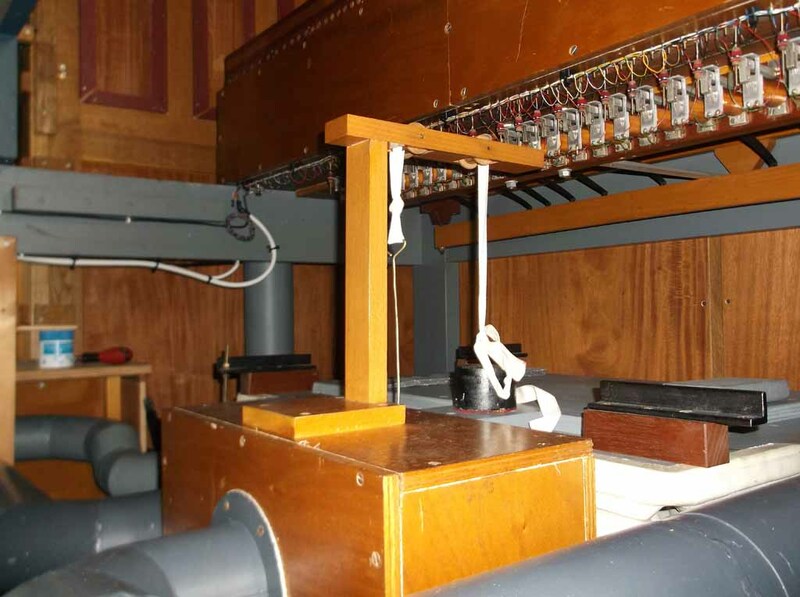 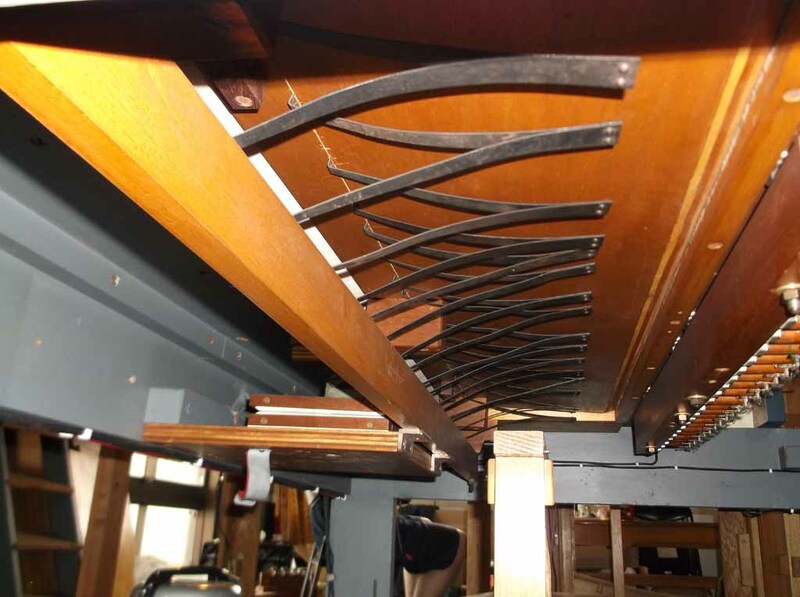 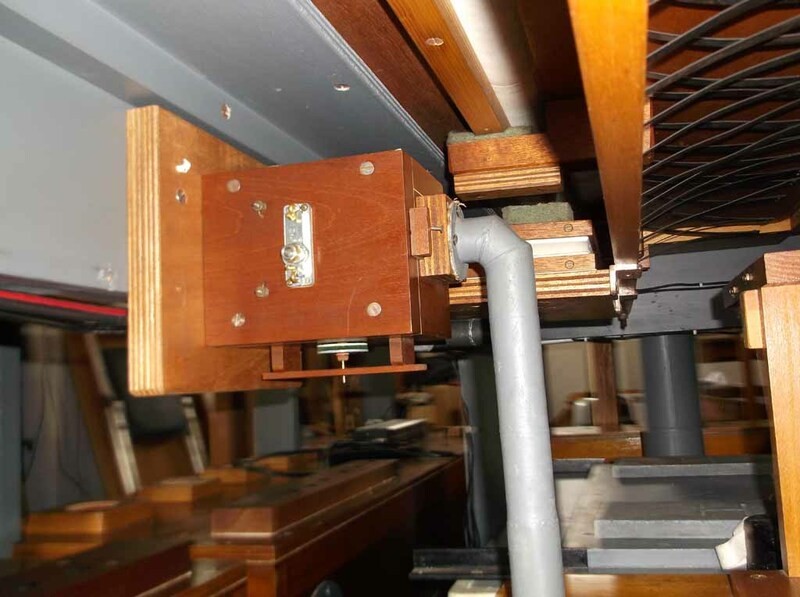 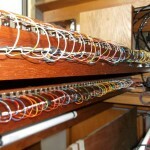 New low-voltage wiring and fusing was installed throughout the organ.